There's no bike path on 6A. This is primarily an excerpt from our super-secret riders-on-the-trip-only e-mail thread, but I think it has a few pieces of good advice for anyone following the blog and our trip who thinks they might want to do something similar one day. I also want to include a packing list for you loyal followers sometime soon. One quick thing, before we get to the meat of it, don't ride 6A up the Cape, it's a stupid thing to do. 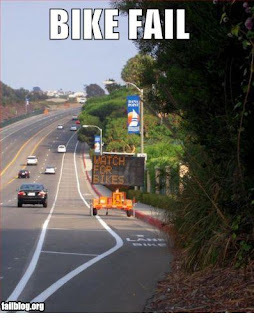 There is no shoulder, or bike lane- take the bike path! So, on Sunday June 26 and Monday June 27th Erin, Dustin, and I embarked on our first fully loaded test run. Our planned route was from Boston to Dustin's parents' house in Sandwich, MA (about 70 miles) and from there to Provencetown (about 62 miles) and we had a few real revelations. The first, and most obvious, is that riding a fully-loaded bike is much different than just bombing around town. Tight turns are pretty much right out. You don't notice it as much riding, but it certainly saps your strength and makes everything a lot slower. I think our average speed was 11-12 mph. Second, eat, eat, and eat more. Our first day we made the mistake of packing only a light lunch and a bunch of Clif Bars and energy gel. This was fine until around forty miles or so, when you could start to feel fatigue creep in. At sixty, sixty five, we ran into a wall. After we got to Dustin's house, we ate like we'd never seen food before and made sure that in the morning we ate an extra heavy breakfast- at least two bagels, some fruit, and pasta salad. Then we stopped at the grocery to ensure that we were fully stocked for our breaks. Dustin and I made an effort to find foods high in calories that also had some nutritional value. We walked out with a handful of nectarines and plums, half a lb of salami, a baguette, a container of hummus, and two packages of beef jerky. This was just enough for three people for the rest of the day, and Erin and I ate even more when we finally made it home that night so food will certainly be one of our biggest expenses, and biggest physical burdens. The main conclusion we drew from this is that breaks from riding for food are very important, Dustin estimated that we each burned nearly 4,000 calories a day. We were aiming for a break around every 15-20 miles and at least two stops where a fair amount of food is consumed. This was in addition to about 1,000 calories in energy gel and mini clif bars I ate while in the saddle. I also found myself drinking around 3/4-1 gal. of water a day, and am planning to carry at least half that amount at any given time with storage for about 1.5 gal in water bladders and bottles. Thirdly, sticking together is not really that hard, but with more people, that will become a larger obstacle. We found that even with just the three of us, handheld radios would be a big help in keeping everyone in touch, organized, and safe. Even though most of us will have cellphones, the handhelds would be quicker, more accessible, and more durable (as Erin found out when her Android got killed by a car on 6A.) Turning your head around every mile or two adds up to neck strain, and is certainly not as safe as just watching the road. This is up to everyone to bring with them, or not. I'm planning on buying a pair of battery operated units to eliminate charging, and because units that charge without a dock don't seem too prevalent. Fourth, route planning is going to be very important. We all need to know where we are going and how to get there in case we are separated. Radios and cellphones will mitigate any negative impact that getting lost or separated would have, but valuable time and energy will be saved by everyone knowing and having a say in planning the route. Dustin took a wrong turn Sunday and cost his legs an extra 8 miles, I think, of riding and that ended up taxing him pretty badly at the end of the ride. Monday we took the scenic route on accident and had to do a little backtracking and looping to find our way. We ended up having to go back up this mean hill and I strained my knee getting up it (admittedly in a bit of a huff) which really turned the last twenty miles into a much less comfortable endeavor for me. Getting lost blows, so careful planning and knowledge of the area is a must. That's another reason why Ben getting copies of those maps is important. Arm in arm with route planning is destination planning. I think we're going to have to plan pretty conservatively at first. We found that 40 miles was a breeze, 50 was good, 60 was definitely enough, and 70 was more than any of us could do and still be having fun at the end of the day. 50 miles is a good limit, not only because more riding is a little harder, but also because, as I touched on a bit earlier, keeping our bodies fed, provisioned, and well rested is going to be a full time job. The riding is kind of incidental, you just do it. Buying food, washing clothes, cooking, making camp, and all the other things that we'll be doing take time. We did 70 miles in about 8 hours or so each day. We started later than we wanted both days, but also found that even getting three people up and out at the same time is a challenge. The logistics will be a pain at times, but if we plan well, pack intelligently, and keep in mind that the trip is supposed to be fun, we should be ok.
Hey guys! I worked with Mandi at Beacon Press (I'm one of the IT staff). I did a lot of the route you're doing last summer! (I did the Western Express>Trans Am route). Sounds like you're in pretty good shape for the trip. Good luck! Oh, and the ACA maps are mostly pretty excellent, don't forget to check for updates though! We almost missed a detour in Kansas due to not reading them that would have added 10+ miles to our day. Lmk if you want to talk about places to stay on the route.